If you’ve spent any time in the South, then you know what a “mess o’ greens” is! Best of all, these cruciferous veggies are a concentrated source of good health. 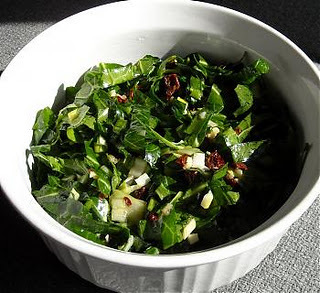 Collards, kale, and mustard greens provide a plentitude of nutrients. They provide nutritional support for detox, and are antioxidant and anti-inflammatory. The array of antioxidant phytonutrients is quite amazing—well over 45 and counting. · Always choose greens that are bright and crisp, with no yellow or brown spots and no discolored edges or small holes. Colors should be vibrant; yellow leaves mean they’re long past fresh, and have lost much of their nutritive value. · Store for no more than a few days. Keep them in the coldest part of the fridge in a zip-lock bag with the air squeezed out. 1. In a large heavy pot, bring broth to a boil. Add remaining ingredients, return to a boil. Reduce heat to low, and barely simmer for about 1 ½ hours, stirring occasionally. 2. Remove ham hock or drumstick; shred the meat, discarding all skin, fat and bones, and return meat to pot. Crush garlic cloves with a fork and give the whole pot a good stir.